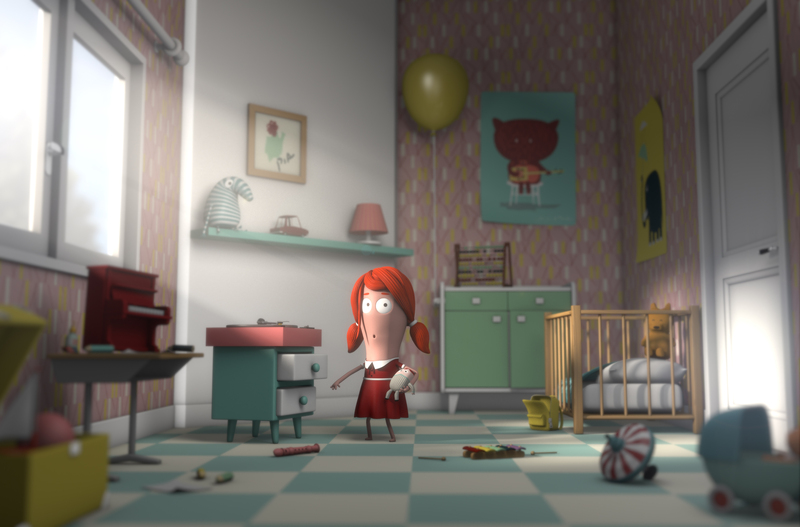 Only two of the five nominated films are obviously the project of computer-generated images, while the others use either hand-drawn or stop-motion animation. (They may use computers to aid in this — we’re not Luddites, after all). Add in a few more “Highly Considered” animated shorts to round out the program, and you’ve got nine animated films that show a wealth of styles, moods and tools. My favorite of the bunch is the shortest, a film that runs less than three minutes called “A Single Life.” A woman finds a mysterious 45 RPM single and puts it on, only to discover the catchy song playing seems to control her life. Move the needle back, and she’s a young girl. Move it towards the end of the song, and she’s a doddering old day. It’s a clever, funny conceit, and a reminder to enjoy life — that needle is going to run out of groove sooner or later. Disney has another awards-nominated entry with “Feast,” which played before “Big Hero 6.” Reminiscent of Disney’s “Paperman” from 2013, this unabashedly romantic film shows the arc of a love affair from the perspective of the guy’s dog and what he sees in his food bowl. (When the woman moves in, suddenly his diet gets a lot healthier). It’s zippy and sweet. “The Dam Keeper” should be of special rooting interest for Madison viewers — the piano-and-cello soundtrack was created by two members of the Baraboo band Phox. The film itself is a stunner, using 8.000 separate, lush paintings to tell the story of a lonely pig who must man the windmill that keeps poison gas from enveloping his town. The film gets a little darker (literally) than younger audiences might be ready for, but ultimately it’s an affecting tale of friendship. “The Bigger Picture” is an anomaly in this year’s crop, aimed squarely at adults in its tale of two adult brothers and how their mother’s illness gradually forces them to put their grudges aside. The ingenious stop-motion technique of filmmaker Daisy Adams involves mixing life-sized paintings of the characters on the wall with real objects in front of them. “Me and My Moulton” is the fifth nominated feature, Torill Kove, Oscar-winning director of “The Danish Poet,” returns with a wry autobiographical tale of a girl growing up in 1960s Norway and craving a bike. The drawings are simple (almost like from a TV show of the era) but expressive, and the dry but empathetic narration is a riot. That’s the five nominated films. 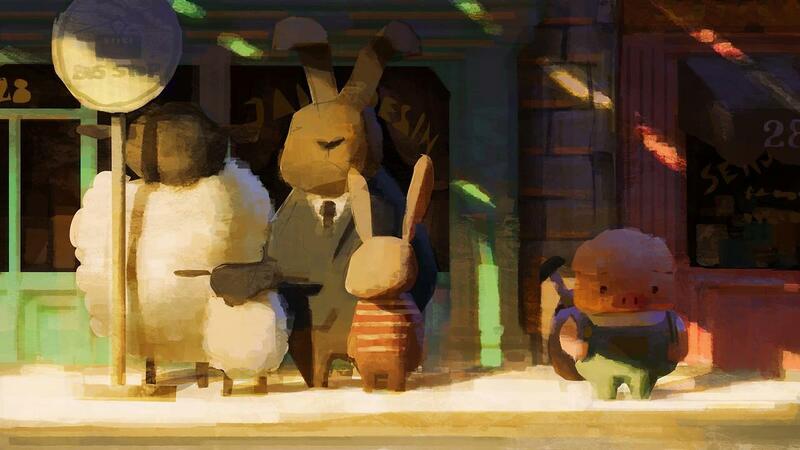 My money is on “The Dam Keeper” to win, as it’s so beautiful and so much work clearly went into it. The dark horse, though, might be “The Bigger Picture,” because it combines an innovative design and very moving story. The program will feature four other shorts as well, including “Footprints” from the legendary Bill Plympton. In this parable on xenophobia and paranoid politics, a man sees a hole in his window and decides to hunt down the fearsome, evil, entirely imaginary monster he thinks is responsible. “Duet” is from the legendary former Disney animator Glen Keane, who created classic Disney characters like Ariel and “Beauty and the Beast.” Here, in his first film as a director, he presents a graceful tale of two people who grow up and fall in love. The animation is deliberately rough and unfinished, allowing the characters to dance off the page like they were coming alive in Keane’s notebook. “Bus Stop” is a funny, minimalist tale of a woman who fulfills her dream of becoming a school bus driver. The only real dud in the bunch is “Sweet Cocoon,” which is somewhat offensive in its tale of an overweight female caterpillar who can’t fit into her cocoon, moves on through unfunny gags, and ends on a jaw-droppingly inappropriate note.